An art installation by Wayne State University artists Cheri Allen, Louis Casinelli, Rory Chapman, Matt Doyle, Katie Etchill, Jan Janiczek, Sean Marshall, Matt Pawenski, Nick Portice, Michel Soucisse. Curated by Lindsay Satchell. Concerned by the suggestion that modern people are visually oriented to the point of other-sensory atrophy, “Sense of Site” aims to explore and develop all five senses, particularly in relationship to our understanding of physical spaces. Inspired by such installation artists as Ann Hamilton and Bernhard Gal, ten Detroit artists will appeal to our senses while exploring spatial relationships. 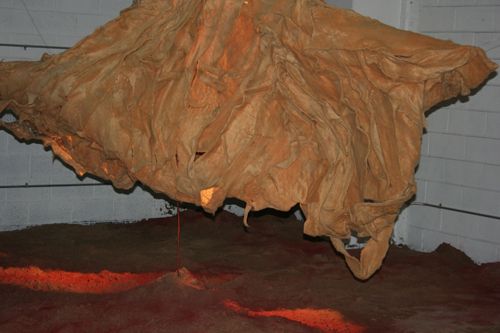 The innovative art exhibit Sense of Sight opened Friday at Detroit Industrial Projects and The Overpass, two galleries located in the Russell Industrial Center. 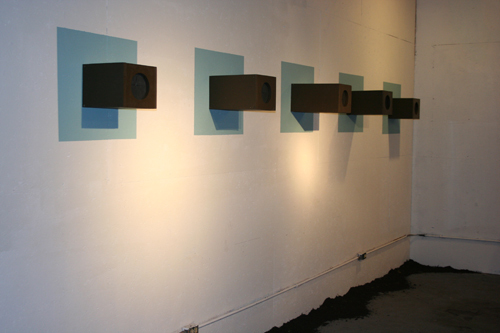 The exhibit contains the installation art of all10 of the art major students in the Mixed Media Installation Art Course led by WSU instructor Lindsay Satchell. It is based on two ideas, “the idea of the five senses, a sensory experience, then relationships, some relate more to space and some more to the five senses,” Satchell said. 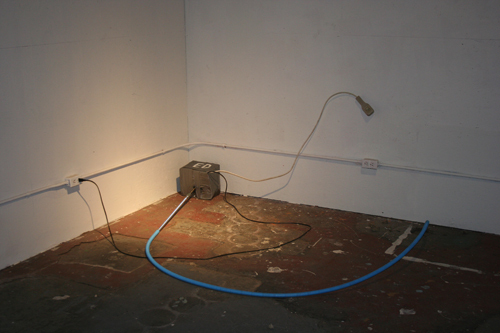 “Installation art is a lot more site specific, process oriented, conceptual,” according to Strezinski. 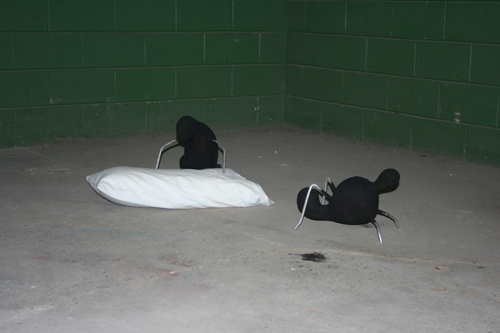 Satchell adds, “it isn’t necessarily about a discreet individual object, it’s about creating an environment or creating an experience.” The installations were fabricated by the students in the galleries just a week prior to the opening and are their final projects for the class. The Russell Industrial Center is historically significant in Detroit’s automotive industry. It was originally home to the Murray Mfg. Company, an auto body supplier that manufactured stamped sheet metal parts. It is now home to not only these galleries, but also many businesses, artists, craftspeople and printers. 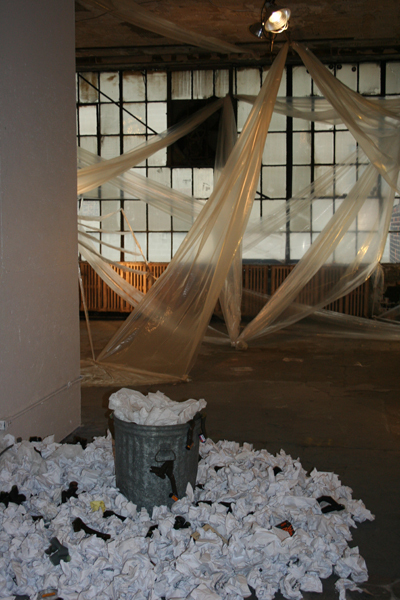 Michel Francois Souisse’s “Things Passed” relates to the industrial space that it was created in. 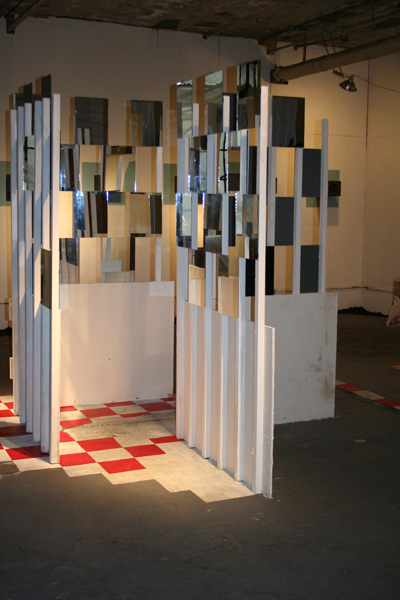 “I feel like a lot of it came together when I came here and I saw the texture of the walls and ground,” said futurist and cubist-inspired Souisse, “I really wanted to address the decay of the space.” The many mirrors in his walk-through exhibit represent what’s real and what’s reflected. 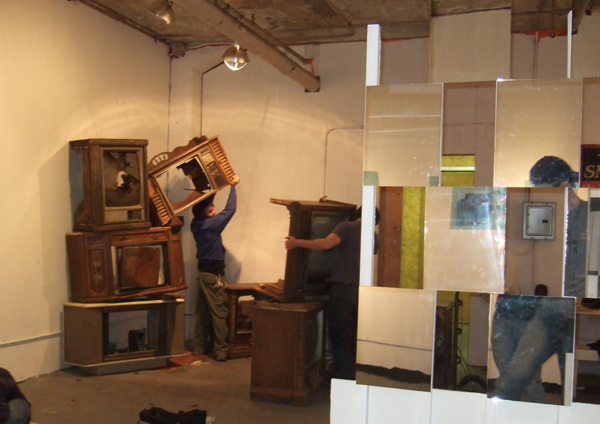 The highly imaginative “…records,” displays old console televisions sets that are stacked by design and include electrical cords that run from one gallery to the other to connect the exhibits. A video displays what is happening in the opposite gallery. The artist is Matt Pawenski, who describes himself as an installation, performance and tattoo artist. He also employs The Overpass Gallery as his own studio and gallery. “I thought a lot about technology and how it changes our life, how it transforms or deconstructs space.” Pawenski said. “Since there’s video [recording and] playing from the other space here, and vice-versa, you’re in both spaces at the same time.” You’re in one gallery space through video and the other physically. Sense of Sight is a “full sensory experience.” It uses our senses to enhance our awareness of existence. 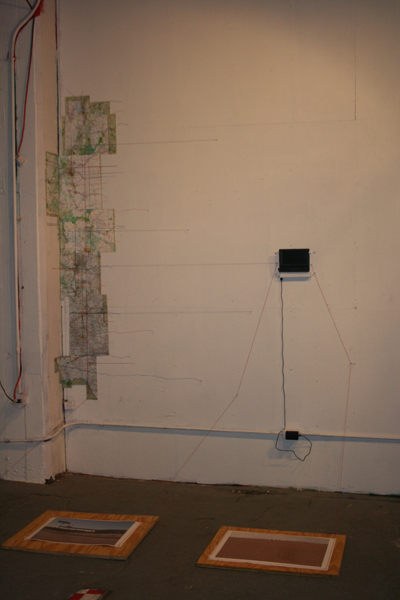 It’s intent to deal with our understanding to physical space and develop an awareness beyond what is seen is accomplished superbly through the ingenuity of these inspirational Wayne State artists. The exhibition runs through April 19th. The galleries are located in buildings one and two of the Russell Industrial Center on Clay Street in Detroit.